It's been almost 20 years to the day since Kurt Cobain's suicide pulled the rug out from under rock and roll. On April 5, 1994, Cobain shot himself, devastating fans across the globe and securing his membership in music's pernicious "27 Club." While somewhat less ambiguous than, say, Elliott Smith's oft-questioned demise — Cobain left a lengthy (and heartbreaking) suicide note — many still fret over the tragedy's precise cause, citing drug abuse or even conspiracy; Seattle law enforcement even recently released new photographs of Cobain's crime scene for obsessers to mull over. Still, there's one thing we can all agree upon, regardless: It came much too soon. Of course, with two decades officially gone by since Nirvana's fandom was at its height, there's a good chance that some of their original oomph has been lost in translation, their X-ed out smiley face logo reduced to fodder for Delia*s t-shirts. That video of kids watching the "Smells Like Teen Spirit" music video for the first time is nothing if not telling, and in the least delightful way. Plus, with Cobain's legacy likely about to be turned into a Broadway musical (please, dear God, keep it away from the guys who did American Idiot), it seems high time to trot out some reasons why we should all revisit Nirvana and re-appreciate their frontman, the late, great Kurt Cobain. "I have a memory of them coming out and he had his middle finger up, was giving his middle finger to the audience. ... I'd seen a lot of punk shows and I'd seen a lot of bands when I was younger where the shows were pretty aggressive or confrontational, but there was something completely different about this. I remember he had a smile on his face, there was a kind of playfulness, but it was also a little menacing, and I remember the minute they started playing, the entire audience erupted in a way I hadn't seen before. ... And I can tell you, any situation I've been in and many of my peers I've seen coming up, playing for audiences who've never heard of you, you don't get people's attention at all. Usually they're talking or going to the bathroom in those kinds of situations, but they had the audience from the first note. Even if they had never become successful, I would still remember that." In addition to befriending riot grrrl Kathleen Hanna, wearing dresses in concert, and proclaiming himself "gay in spirit" (a favorite quote of his: "I'm not gay, although I wish I were, just to piss off homophobes"), Cobain frequently gave his audience disclaimers such as, "If any of you in any way hate homosexuals, people of a different color, or women, please do this one favor for us: Don't come to our shows and don't buy our records." (An iteration even exists in the Insecticide liner notes.) Preach, sir. Also, for the record, he looked pretty good in that dress. When Nirvana first came to be, the primary form of mainstream rock and roll was, essentially, hair metal: bombastic, hook-fueled tracks, minutes-long guitar solos. In short, it was drastically in need of some new blood. Blooming as they did in the dying days of punk, grunge bands seemed to represent a new, jaded act of rebellion: anger at the ineffectuality of anger, a resigned yet cutting cynicism packaged in catchy pop-worthy melodies — of which Nirvana was one of the primary dispensers. It makes perfect sense to me that Beck would cite Cobain as an influence, especially after hearing his anti-anthem "Loser" (which, for the record, is my go-to at karaoke). Of course, to reduce the narrative to "Nirvana against the world" would be far too simplistic and ultimately foolish; plenty of bands were incorporating similar moods and tactics and plaid shirts before and during Nirvana's reign (see: Husker Du, Alice in Chains, Pavement, the whole Seattle Sub Pop scene). Kurt Cobain didn't "invent" alternative frontman-hood, but he did help popularize it significantly, even explosively. For whatever reason, his particular brand of blithe emotionality jived perfectly with the ever-elusive youth market, allowing Nirvana to reach multi-platinum, MTV-hyped heights — and most importantly, thus proving to mainstream record label execs that this was indeed what the kids were into these days. So, if you're thankful for or Beck or The Black Keys or Ben Lee or early Weezer (you can hear it most, I think, on "Say It Ain't So") — even, apparently, for Lil' Wayne — you should also be thankful for Kurt Cobain. 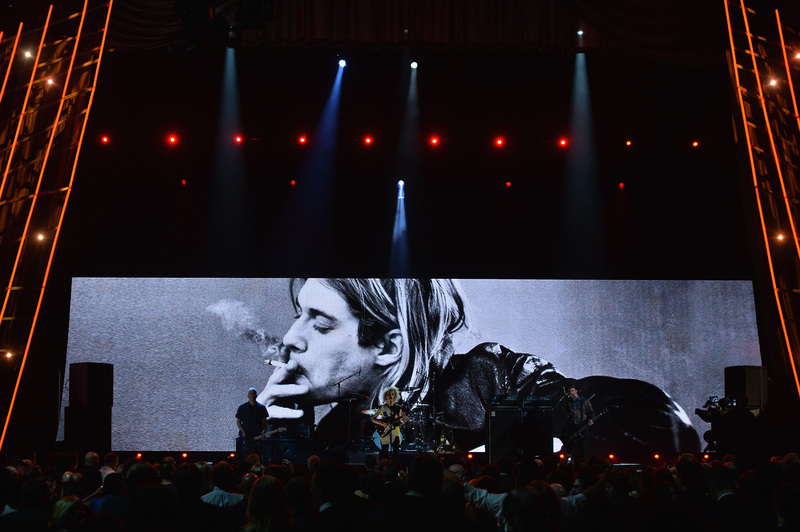 On April 10, Nirvana is finally entering the infamous Rock 'n' Roll Hall of Fame. Or, well, "finally" by my impatient standards, but "ASAP" by the Hall of Fame's: Inductees' first albums must have been out for at least a quarter century, and this year marks Bleach's 25th birthday. Michael Stipe, lead singer of REM and close friend of Cobain's, will apparently do the honors in a ceremony at Brooklyn's Barclays Center, the first ever induction that will be open to the public — which is, I think, fitting. Look, honestly, even if you think you've gotten everything you can out of the Nirvana catalog, then check out some of the truly excellent covers of Cobain's work, from bands as varied as Patti Smith, The Polyphonic Spree, a jazz trio, a string quartet. Personal recommendation: Jay Reatard's "Frances Farmer Will Have Her Revenge on Seattle" is especially touching, given the singer's similarly tragic Cobain-esque demise.